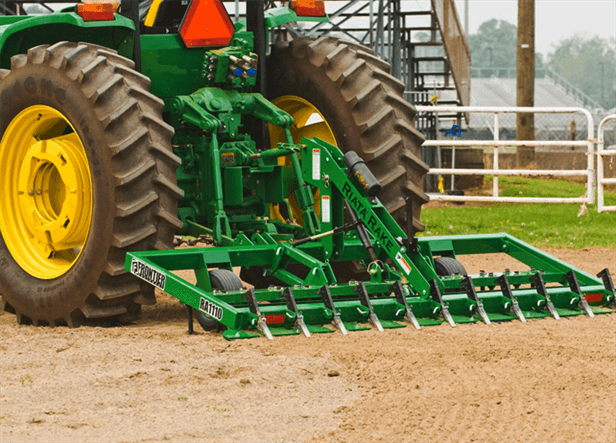 The RA11 Series 3-Point Arena Rakes (above) are compatible with a wide range of utility tractors and are available in two cost-efficient models: 8-foot RA1108 and 10-foot RA1110. Attach the RA1084 (right) to your ATV, Gator XUV and HPX Series Utility Vehicle, or small utility tractor with a 1 7/8-inch ball hitch. The RA1084 has a 7-foot working width and an adjustable finishing comb.